Pop the cork! Bring luxury and a healthy-looking glow to your face. With elegant champagne, white truffle and caviar extracts, this unique beauty serum helps rejuvenate your skin's appearance, helping prolong its youthful look. It's time to celebrate. Formulated with champagne extract - from the vineyards in France's Champagne region, these hand-picked grapes are born from a delicate combination of climate and soil that yields the grape's exceptional nature. Champagne is synonymous with celebrations and emotional pleasure, reminding one of victory and success. Ingredients: Propylene Glycol, Cyclopentasiloxane, Water (Aqua), Alcohol Denat. ; Cyclohexasiloxane, Saccharomyces/Xylinum/Black Tea Ferment, Sodium PCA, PEG/PPG-18/8 Dimethicone, Octyldodecyl Stearate, Polypeptide-1, Glycerin, Maltodextrin, Tuber Aestivum Extract, Dimethiconol, Hydrolyzed Rice Protein, Wine Extract, Hydroxyethylcellulose, Isodecyl Isononanoate, C4-24 Alkyl Dimethicone/Divinyldimethicone Crosspolymer, Zingiber Cassumunar Root Oil, Polydiethyleneglycol Adipate/IPDI Copolymer, Polysorbate 20, Phosphate Buffered Saline, Albumin, Sodium Chloride, Phenoxyethanol, Amyl Cinnamal, Benzyl Salicylate, Citronellol, Geraniol, Hexyl Cinnamal, Butylphenyl Methylpropional, Limonene, alpha-Isomethyl Ionone, Fragrance (Parfum), Yellow 6 (CI 15985). My first impression was I really liked the scent. After using it for awhile I notice a definite difference in my skin's appearance - smoother, lines diminished. Good product. I love the Prai. My skin is very sensitive and this cream/serum is one of the best I have come across. My skin feels so smooth. Thanks for introducing me to this fabulous product!! 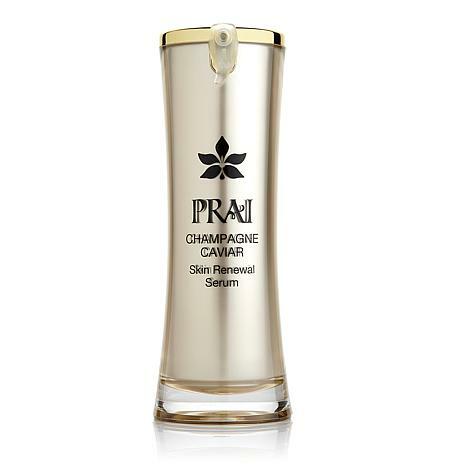 This is the product that started my love affair with Prai. I've been using it for a couple of years, and I love the glow of my skin. I also notice that my skin is never dehydrated anymore - it really keeps your skin moisturized 24/7 without being greasy. Have only been using this for a few days so I can't see noticeable results. Like the way is smells and feels on my skin. love this product !! the feeling is silky makes your face feel like silk. gives you skin nice glow.